A lean and versatile Montmorency product who was often too courageous for his own good. Watson debuted as an 18-year-old, kicking two goals from six scoring shots against the Brisbane Bears at Victoria Park. 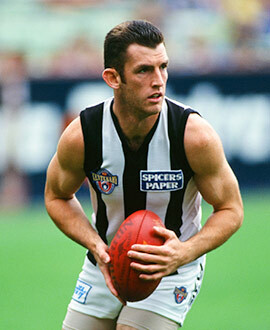 He held his place until round nine, kicking five goals in just his third game against Essendon at Waverley Park. Opportunities were limited in the second half of the year, but he stamped himself as a player of the future when he played 20 of a possible 22 games in 1993, averaging 16.5 disposals per game and finishing runner-up to Mick McGuane in the Copeland Trophy. Watson spent much of his early years across half back and showed great resilience to rebound from a succession of bad head knocks. When in peak form he impressed as a player with a cool head under pressure who could deliver the ball well. A strong pair of hands equipped him for jobs on taller players when in defence, and he was a good reader of the play. His courage was never questioned, but it placed him in situations where he was cleaned up by oncoming opponents. Watson won 18 disposals in the heartbreaking two-point loss to West Coast in the 1994 Qualifying Final and was a regular throughout 1995. He missed a large chunk of football in the second half of 1996 but made his mark as a forward upon his return, kicking four goals in each of the last two games of the home and away season. He put together a solid 1997, marred only by a one-week suspension for a collision with West Coast playmaker Peter Matera in his 100th game. Switched into attack on a perminant basis the following year, Watson enjoyed his best season since ’93, kicking 33 goals from 54 scoring shots. At 186cm, Watson was the perfect foil for the Rocca brothers, with his safe hands and football smarts netting him two bags of five goals, both at Waverley Park. He polled a Brownlow vote after slotting five in a big win over the Hawks in round 16, but it would be another 18 months until he sang the song in victory again after an indifferent 1999 that saw him play just three games and none after ANZAC Day. The arrival of Mick Malthouse brought new opportunities, but aside from a three-goal, 26-disposal haul against the Kangaroos in round six, Watson’s campaign didn’t find the level of consistency it needed for him to maintain his place in the first choice 22. He played his final match against Adelaide in round 17 – ironically, the same nondescript game that marked the end of Sav Rocca’s career – and he was delisted at season’s end. Despite rumours that he might line up with Essendon, he turned out for the Northern Bullants in the VFL, winning the club’s best and fairest in 2003. He coached Lower Plenty in the Diamond Valley league and then worked with TAC Cup clubs Sandringham and the Eastern Ranges. He was lured to North Melbourne as an assistant to Brad Scott.